From snorkelling with sea lions to hanging out with dinosaurs, here are the best things to do in Puerto Madryn. After a very cool 3 days in Buenos Aires, it was time for us to continue our overland journey south through Argentina. 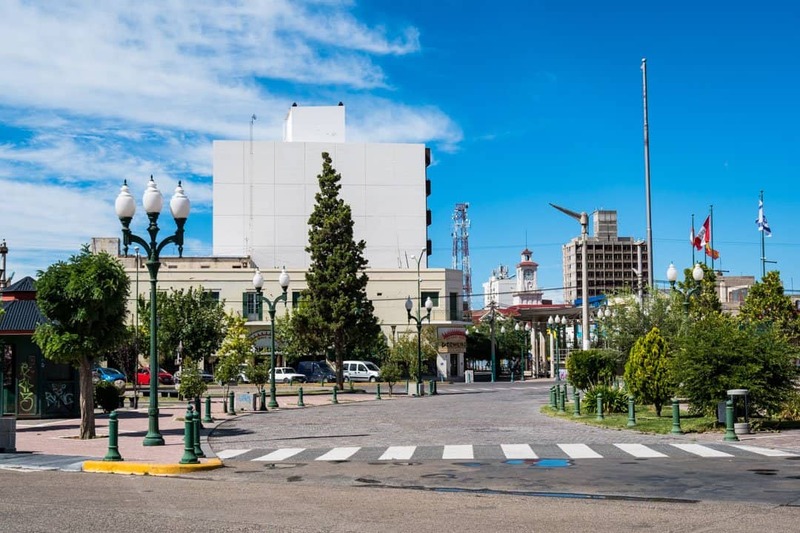 We made a stopover in Bahia Blanca, then took the overnight bus to a town that we couldn’t be more excited to visit – Puerto Madryn! 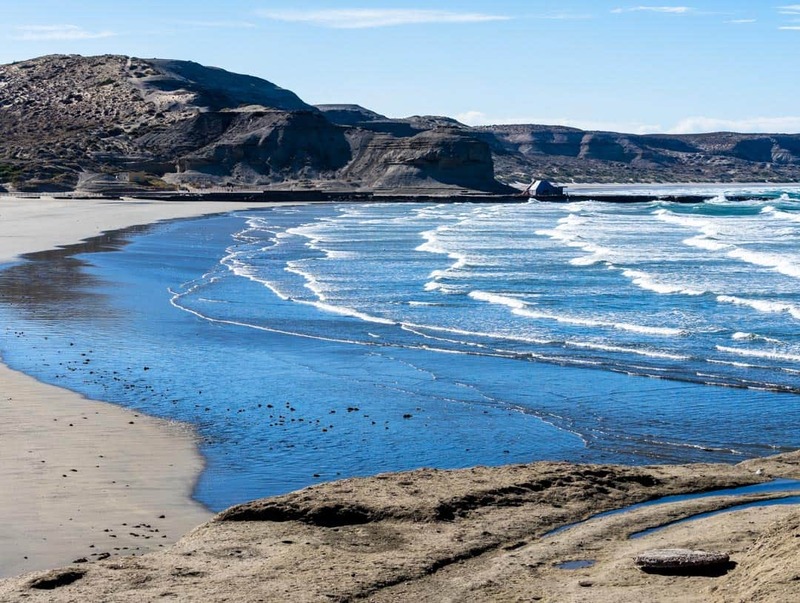 This mid-size Patagonian town is famous for its up-close-and-personal marine life encounters, and having learnt about all the amazing things to do in Puerto Madryn we were pumped to finally arrive. Trying to figure out all the best activities to explore in this area can be overwhelming, so we’ve put together this post to help with your travel planning. We only had 3 full days in Puerto Madryn, and to be honest it wasn’t nearly enough. This really is a place where a longer stay is better. For reference, we booked all our tours with Argentina Vision, who are the largest and best tour operator in Puerto Madryn. Here are 8 awesome things to do in Puerto Madryn! Sea lions chilling out on a beach in Punta Norte. This could just be one of the cutest things to do in Puerto Madryn. Actually, this could just be one of the cutest things to do ever! 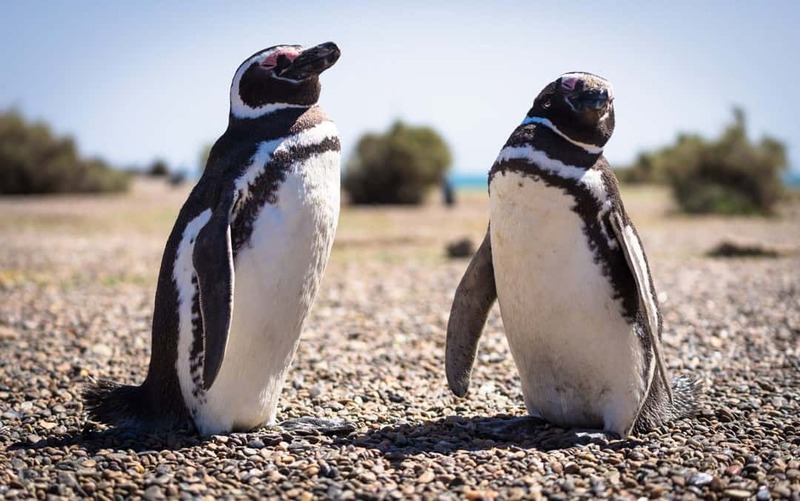 The area around Puerto Madryn is home to huge colonies of Magellanic penguins, with the largest being in Punta Tombo, and another popular spot being at Punta Norte in Peninsula Valdes. 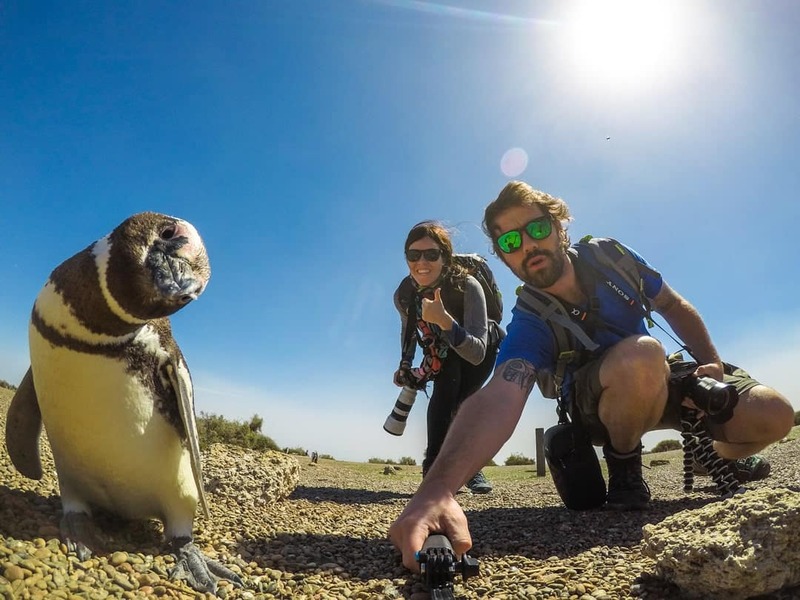 In these two places you can walk amongst hundreds of Magellanic penguins, following a marked path down to the beaches. The penguins wander freely, so you need to be careful not to step on any of their nests or get in their way. What makes this such a unique experience is that you can get incredibly close to the penguins. They aren’t shy at all, so you can get right up to them for photos. Just be sure not to touch them, or harass them in any way. If you’ve ever dreamt about hanging out with penguins, then Puerto Madryn is the place to do it! Alesha couldn’t wipe the smile off of her face for days after getting up close and personal with these gorgeous creatures. You can rent a car to get out to Punta Tomba or Punta Norte, or take a tour from town that includes other stopovers and an English/Spanish speaking guide to give you as much information as you need. 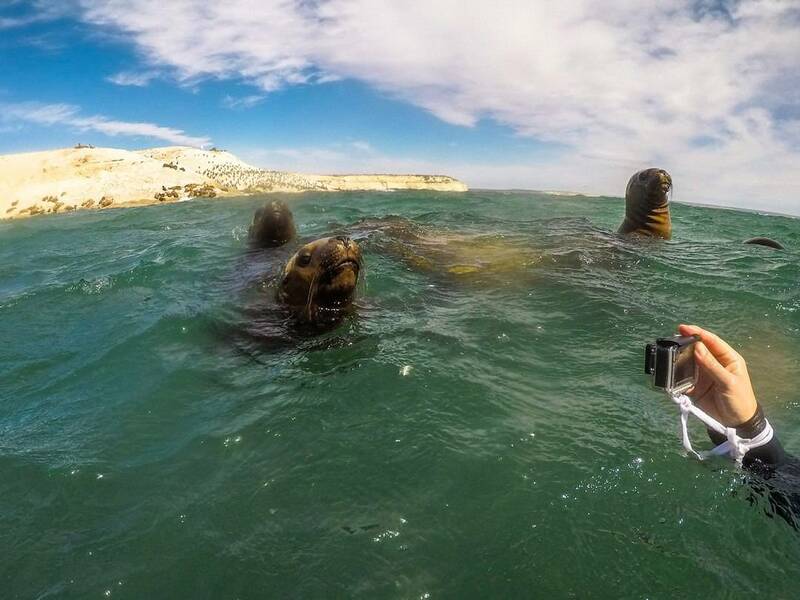 We didn’t even know that snorkelling with sea lions was a thing before we came to Puerto Madryn! Just a short boat ride away from downtown Puerto Madryn is Punta Loma, which is home to a stable population of 600 sea lions. Unlike other places in the world, these sea lions are always present in Punta Loma as they are protected from threats such orcas (which also patrol the waters near Puerto Madryn). This means that visiting the sea lions is possible 365 days a year. We jumped on a snorkelling tour with Lobo Larsen and headed out to play around in the water with these majestic mammals. For 45 minutes we snorkelled around while the sea lions dove and jumped between us. Being this close to them in their natural environment was truly incredible. There’s also no need to be scared, because while the sea lions can be a bit aggressive on land, they are perfectly placid and curious in the ocean. They came right up to our cameras, danced around us and even brushed up against our bodies. 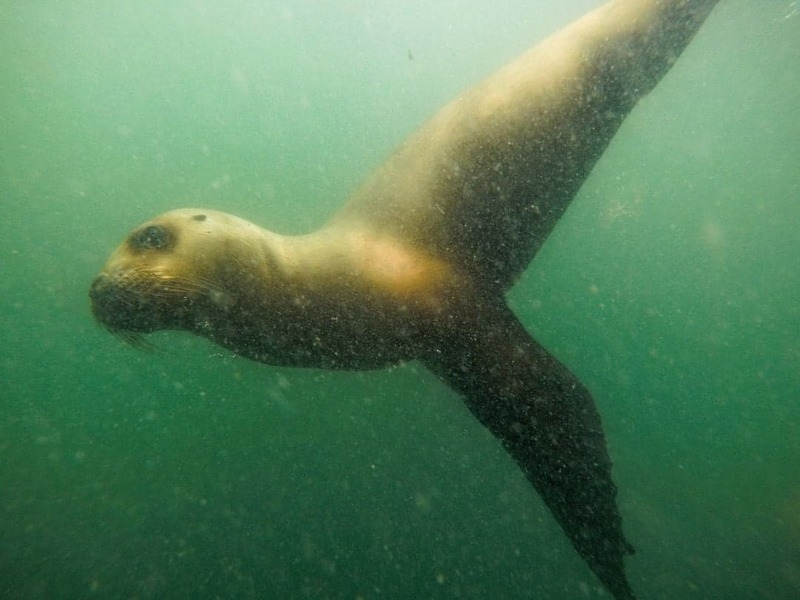 Snorkelling with sea lions in Puerto Madryn was something we’ll never forget. It’s also possible to go diving with them, but check what visibility and sea conditions are like before booking this. The sea lions were so curious in Punta Loma. From May to December southern right whales ply the coast off of Patagonia, on their annual migration to breed and calve. The waters around Puerto Madryn, and in particular around Peninsula Valdes, are one of the best places in South America to witness this spectacular species up close. It’s entirely possible to see the whales from the beach, with hundreds of them coming into the bays. But for a real fascinating opportunity, head out on a whale watching tour, which is by far the most popular of all the things to do in Puerto Madryn. Floating out at sea the southern right whales often breach and play right next to the boat, offering a sensational chance to see these 50-tonne creatures like never before. We unfortunately travelled to Puerto Madryn during the wrong time of year to see them, but if you are in Argentina during the right months make sure you don’t miss out on this! We didn’t get out to do a whale watching tour because it was the wrong time of year, so here’s a fossil of a southern right whale in the museum near Puerto Pyramides. One of the funkiest little villages we have seen in Argentina, Puerto Pyramides is the only town in the Valdes Peninsula and is well worth a stopover when looking for things to do in Puerto Madryn. Chill out by the gorgeous beach, relax in the retro cafes or simply use it as a base for all your marine life excursions – The famous Punta Norte is only an hour way! The best thing about Puerto Pyramides is the southern right whales that come into the bay, meaning you can launch off on any number of boat tours, or even spot them from your balcony! 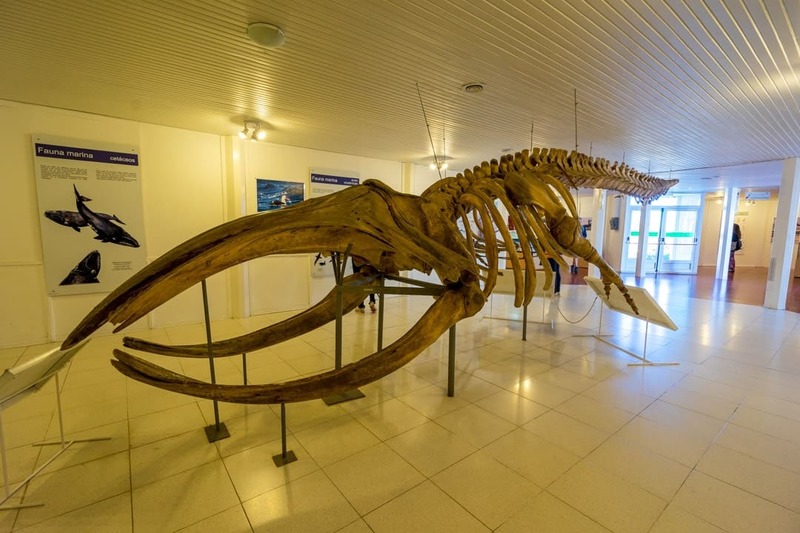 If you have time on your way out there, stop by the museum on the road to Puerto Madryn to see a fossil of a southern right whale, and the skull of an orca. Funky restaurants and cafes are all over Puerto Pyramides. 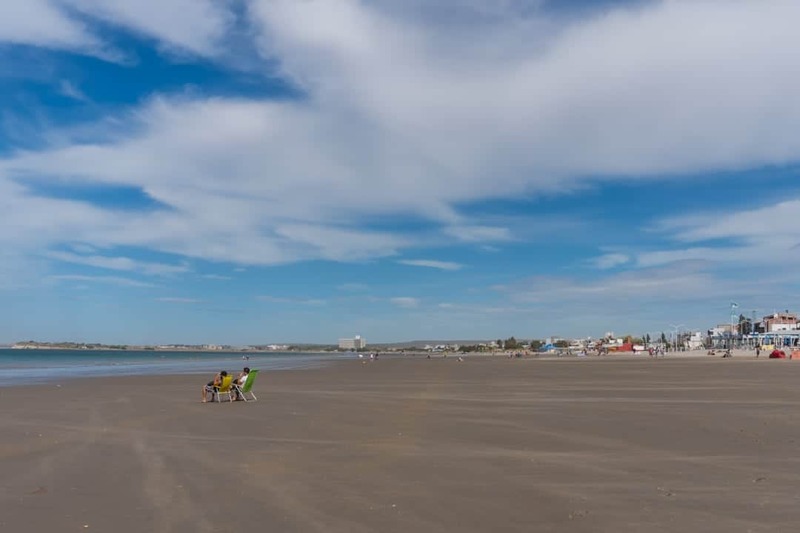 Puerto Madryn has a long, sprawling beach, and while it doesn’t quite compare to the beaches of Australia or Thailand, it’s still a pleasant place to hang out. In the afternoons you can find crowds of people playing football on the sand, families relaxing and everyone more or less just enjoying the sunshine. There are a large number of cafes and restaurants along the beachside street, so you’re never far from a meal or a drink or you’re feeling peckish. When the wind is up (which is often) you can even go windsurfing or kitesurfing. Rentals are available at a number of places. If you’re looking for the best free things to do in Puerto Madryn, this is right up there! The beach at low tide. One of the local things to do in Puerto Madryn. 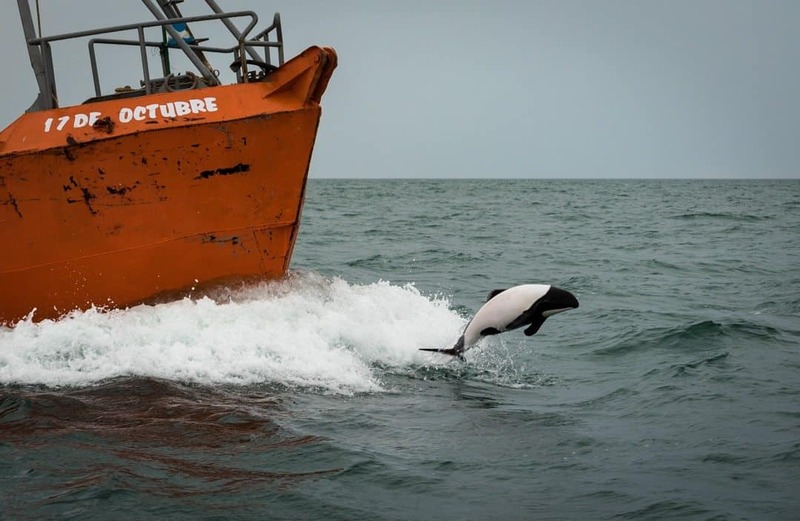 While you’re falling in love with all the marine life around Puerto Madryn, make sure you head out to see the local Commerson’s dolphin population near Puerto Rawson. These beautiful dolphins have distinct black and white colouring, which has also earned them the nickname, ‘panda dolphins’. They can only be found in this part of the world, and an 1984 survey estimated there were about 3400 of them. Going out on a whale watching tour in Puerto Rawson allows you to see these small, extremely agile mammals playing around in the boat’s wake. These tours usually last for around an hour, and the guide onboard will give heaps of information about these rare dolphins. A Commerson’s dolphin playing in the bow wake of a local fishing boat. Back in the late 1800s a group of Welsh immigrants moved to Patagonia and setup a small community just south of the largest city in the province, Trelew. Bringing their language and culture with them, they built up the small village of Gaiman to have a population of nearly 5000 people, and today they still maintain a lot of their distinct values. Today you can visit Gaiman and marvel at this fascinating little Welsh village. The streets are pleasant and there’s a distinct architecture that is unseen in other parts of the country. If you’re hungry and up for a real Welsh experience, drop into Ty Gwyn. 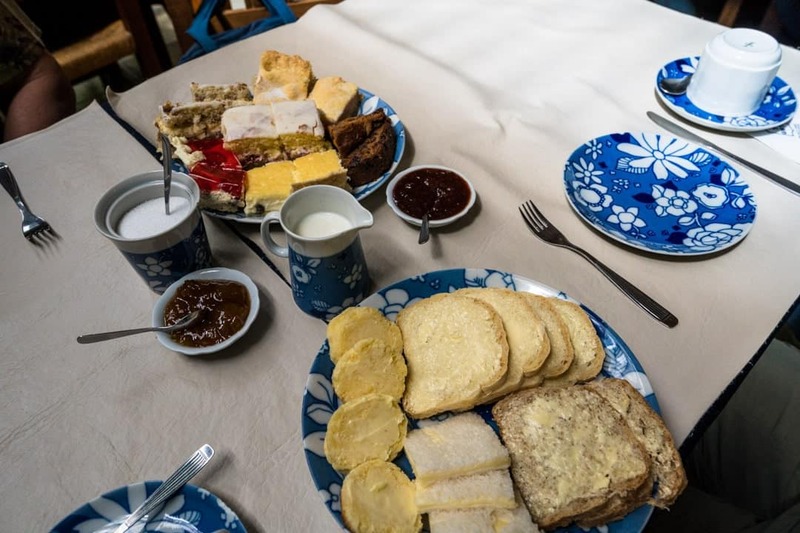 This vintage tea house serves up huge platters of cakes, breads, jams and tea for a set price (280ARS) and one portion could easily be enough for two people. An enormous amount of bread, scones and cakes at Ty Gwyn. 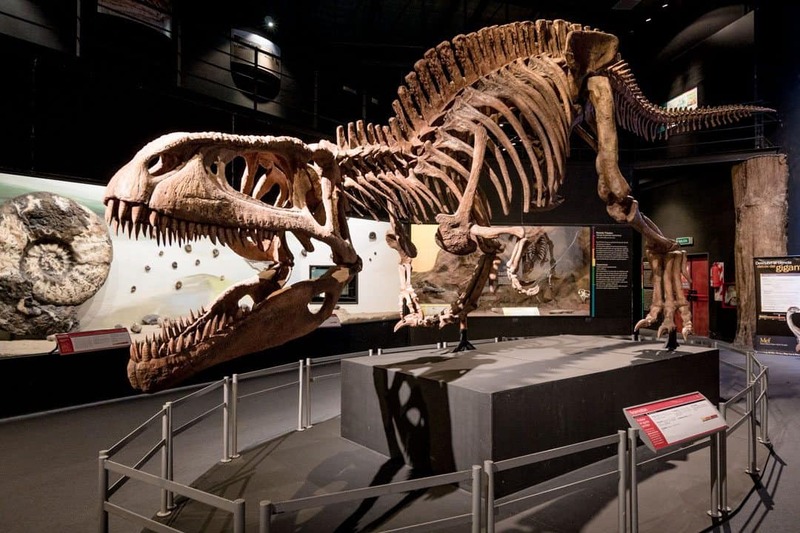 Patagonia is home to some of the most remarkable dinosaur fossils discovered, and the best place to see them all is at the Museum of Paleontology Egidio Feruglio. This large museum has a couple of different exhibitions, housing original and replica fossils from different species of dinosaurs. You can also look into a real lab used for analysing fossils, to get an idea of the technical side of work done by palaeontologists. Recently the largest dinosaur ever discovered was found just outside of Trelew, and depending on the timing of your visit you can see the exhibition here in the museum. A huge fossil replica at the Paleontology Museum in Trelew. There are a lot of cool places to stay in Puerto Madryn, ranging from funky backpacker hostels right up to luxury hotels. Personally we found a very funky AirBnB right downtown and loved our stay there (click here to get $35 off your first AirBnB stay). If you are looking for a hostel to stay in then you can’t go past the HI Patagonia. 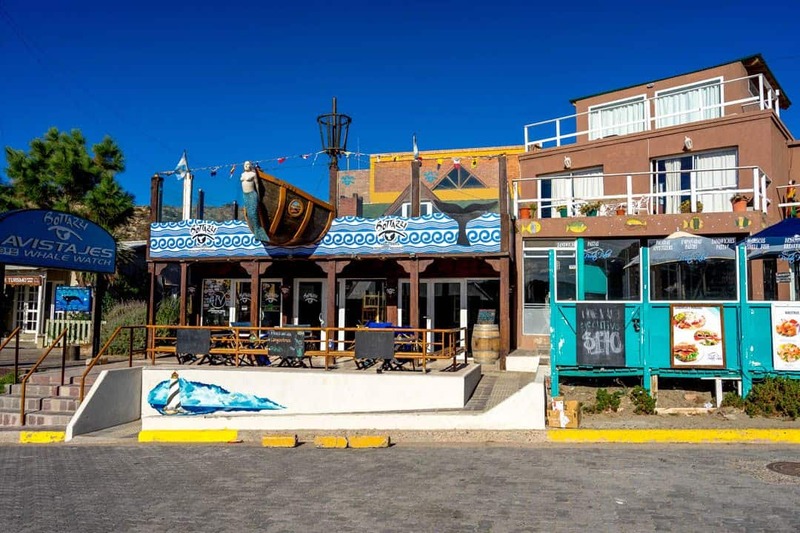 This place is famous for its lively atmosphere and helpful owners, who will give you tonnes of tips on what to do in Puerto Madryn. We met a couple of backpackers who were staying there and absolutely loved it. They can also help with things like car rentals if you’re looking to do that instead of book tours. Otherwise there’s some great options on Booking.com. 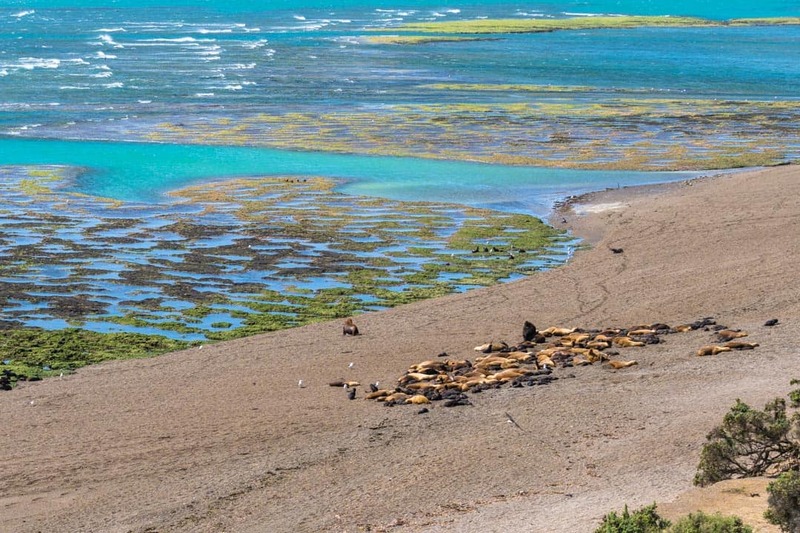 If you’d rather stay out at Peninsula Valdes, which is a worthwhile thing to do in the whale season, definitely check out Oceano Patagonia. This eco-friendly hotel has one of the best locations in town, overlooking the beach and providing guests with a supreme level of comfort. While it’s the beautiful views and rooms that most people come for, you should stay to help support their sustainable practices, such as using environmentally-friendly building materials and geo-thermal heating and cooling. Book your stay at Oceano Patagonia. The beach at Puerto Pyramides. The quickest way to get to Puerto Madryn is to fly to El Tehuelche Airport, about 10km away from town. However flights aren’t regular and they can be expensive. If you don’t mind spending some time on transport, we recommend taking the bus to Puerto Madryn. From Buenos Aires it’s a massive trip, taking about 20 hours, but the buses are comfortable and safe. Most other major towns in Argentina will get you to Puerto Madryn easily as well. Our tours were done as part of our partnership with Argentina Vision and Destino Argentina. All thoughts, opinions and selfies with penguins and sea lions are as always our own. My sun and his family(wife and 3 children 4,7 and 10 years) started a world tour from France. They are now in Puerto Madryn and continue tomorrow to Ushuaia. Travelling is genetic in the family. We are overcrossing Europe with our caravan. Therefore your site is interesting us. Hi Chris, That is an amazing adventure for your son and his family and yourself. I hope you are both having a great trip. Glad you liked our blog. Puerto Madryn is an amazing place. All the best.